I keep insisting that children — everywhere — should have the right to a childhood. But nowadays, we need all hands on deck with this climate change emergency. So how can children help out? They can learn how to grow food. They can participate in the great "homecoming" of people around the world to the land. They can plant seeds and watch them grow. One spring, my students and I, with the help of a parent who understood grain growing, created a pizza garden (in the photo above) and planted wheat on an old farm that has since become a community garden. The families tended this garden during the summer, and then in the fall, the students picked the veggies and harvested the wheat with little kindergarten scissors. We threshed the wheat by hand (ouch! ), and milled it in a parent's stone grinder. We then made pizzas right after milling the wheat into flour. Oh my. Not only was this a fantastic experience for the kids (experiencing the circle of life) but the pizzas were absolutely delicious! I had no idea how much flavour we sacrifice for the sake of convenience. I tell that story because I don't want anyone to think that I'm advocating a return to child labour. No. 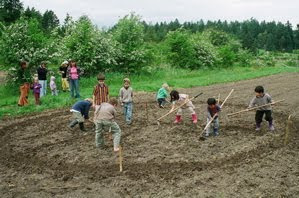 I am advocating a return to children understanding where their food comes from, and being able to grow it locally. Every schoolyard in the world should have a school garden, and children can grow food plants no matter where they live — even in the tiniest of apartments, with pots on a window sill. This is something that children can contribute in our struggle to regain a stable climate. Because without that stable climate, there will be no agriculture, no ready food, and definitely no pizza.